Looking back over 2015, I'm struck by what a tough year it's been for many of us -- on a personal as well as a global scale. And I'm finding that these are the times when I'm particularly appreciative of family and the traditions that remain the same year after year, providing a sense of stability and grounding in a sometimes topsy-turvy world. One of the traditions that has endured in my family is preparing a big family dinner on Christmas Eve. As some of you may know, I don't typically do much cooking, but that all changes on Christmas Eve -- on that day I'll be cooking all day. On the menu: roast beef and popovers with brussel sprouts and many batches of the sugar cookies I used to bake with my Mom. My Dad and in-laws will join us, Bedford Santa will visit and then we'll go to the early service at church. And when it's time to enjoy some adult beverages, we'll kick off cocktail hour with my grandparents' signature cocktail -- the Scarlett O'Hara. 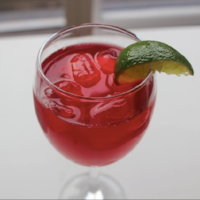 Pour the Southern Comfort, lime juice and cranberry juice into a shaker with ice, and shake well. Strain into a glass or enjoy over ice. And a community tradition that I whole-heartedly support and enjoy is the annual Bedford Minuteman luminary fundraising sale. Each luminary kit has 12 candles, 12 bags and 10 pounds of sand to create beautifully lighted landscapes and entries around town. The fundraisers place the luminaries throughout the town common and this year I bought 50 kits and gave them to friends and clients to spread the beauty all around town! My family is very rooted in tradition and every year I look forward to the big Italian Christmas Eve fish feast, which we've been preparing the same way since my Dad was a little kid. Some of the highlights are baked stuffed clams, baked stuffed lobster, seafood casserole, shrimp cocktail and shrimp dip -- essentially just about anything with fish, breadcrumbs, and butter! And you've got to pace yourself and save some space because, after the many fishes and plates of pasta, we light up the grill at midnight and start cooking sausages, braciola, and vinegar peppers! Some of our family traditions for the holidays include playing Christmas songs on the piano on Christmas Eve, building gingerbread houses, baking cookies, and decorating with paper chains. And the kids each have trees in their bedrooms that they decorate themselves with baseball cards and their own creations. In Brazil, kids get to open their Santa gifts at midnight on Christmas Eve (which is really Christmas day at that point). This is something I look forward to doing with Sam, who's still pretty young, but one day will be very excited to pretend to go to bed, only to hear the "ho ho hos" from Santa by the fireplace and run back to the living room where the adults are hanging out to find the gifts under the tree. It's the one night of the year every kid gets to go to bed really late, and we all grow up looking forward to it and get so very excited about it. Needless to say, we go to bed surrounded by wrapping paper and new toys only to wake up to the fun all over again on Christmas morning. One of my favorite traditions is making Christmas Crackle. My mom and I used to make big batches together before before Christmas and deliver it to our friends and neighbors, and now I make it with my daughter. Though, be warned, it's not a low calorie treat! Once it's nice and bubbly, remove pan from heat and pour evenly over saltine crackers. Spread mixture with a knife... however it doesn't have to be perfect. Try to move fast during this part so the toffee doesn't harden. Remove pan from oven and then sprinkle the chocolate chips on top of the toffee while it's still hot. Let the chocolate chips melt for a few minutes and then spread all over the toffee with a spatula. Sprinkle the toppings on top and then place in the freezer for 30 minutes. Once chocolate has hardened break pieces off the foil and in an container. It will stay fresh for 1 - 2 weeks. When it's time to decorate our Christmas tree, we gather the decorations and declare an appetizer night with all of our favorite snacks, including mozzarella sticks. My husband and I supervise from the couch with a cocktail -- which definitely takes the edge off the holiday stress! How about you? Do you have any cherished family traditions that ground you and bring you together? If so, please share! And whatever you and your family do to celebrate, the entire Suzanne & Company team wishes you peace, joy and love.